Back to focusing on sound – mostly texture, timbre and register. I’ve been trying to think about pitch more in terms of frequency (as opposed to notes) and generally turning things inside out a bit structurally. Also, the more sketches I make, the less inclined I am to try and make beats. Which is handy, as I’m rubbish at it. I’ve been fiddling with the recording setup a little too. Now, when I press record, the computer can ‘choose’ when to record or not, can record things in chunks of random length, and then plays them all back in random order. Then I record over that again, and so on. It’s a brilliantly free way of working. The computer presents me with all sorts of weird juxtapositions that I’d never have thought of or been able to play. I’m still controlling the overall basic structure, but with these setup tweaks, most of the actual creative process is starting to feel really collaborative – there’s no way this sketch could have come from my hands alone. I know things are cooking when I’m not thinking about the computer as a production tool – it’s much, much weirder than that. It feels more like call and response, or group improvisation. Definitely more than the sum of its parts. Much like playing on any musical instrument, I guess. Now that instruments, microphones, studio spaces, recording, speakers, listening spaces and so on are all brilliantly glooping together (well, maybe after we get over all the Retromania) – who is (or will be) the 21st-century equivalent of someone like Teo Macero? Maybe we don’t know yet. Maybe we’ll never be able to know. I haven’t a clue. 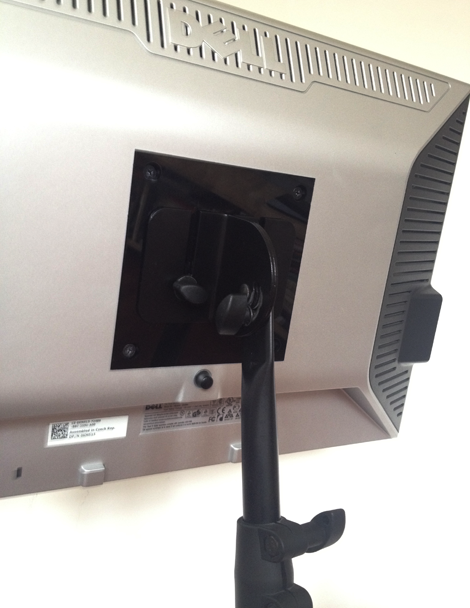 Took apart an old music stand and flatscreen monitor and fashioned a little bracket (3-ply laser-cut acrylic – tidy!) to fit them together. 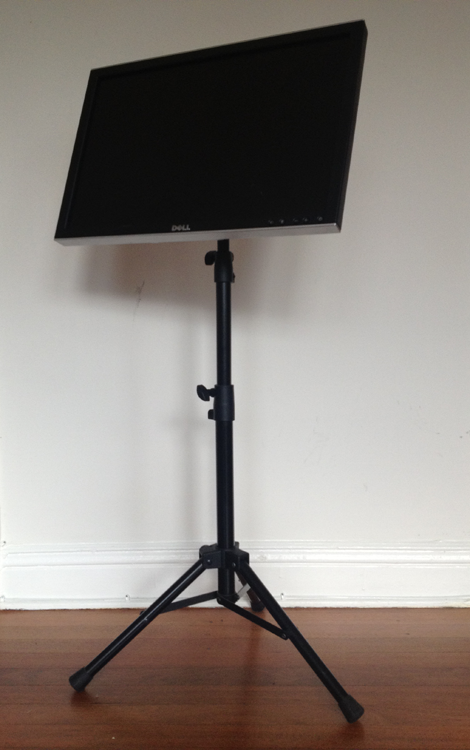 I hear from session musician friends that screen-based setups are pretty common nowadays in stage shows and the like, so this seems a handy (and cheaper) way of creating a similar setup with a laptop and an external video card or two. Maybe. Anyway, It’s a start. When I have a good lot of sketches written, I’ll get back to having a think about live performance. There’s a ton to chew on there. If the music has no beginning or end, how do you present it? Start playing before the audience arrive? Keep playing until after they leave? Should there even be a standard audience/performer stage setup? Who knows. I’d like to avoid getting too art-school installationy though. I need to go off and read some books on the architecture of performance. Much more sketching needed before any of that, though. Back to the group improv for now, man.